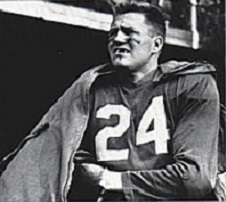 Christiansen initially concentrated on track but became an all-conference football selection at Colorado A & M in 1949 and ’50 and was chosen by the Lions in the sixth round of the 1951 NFL draft. While he starred on both offense and defense in college, Head Coach Buddy Parker put Christiansen on defense as a free safety where he intercepted two passes. He also was an explosive punt returner who averaged 19.1 yards on 18 returns that included four touchdowns. Opposing teams altered their punt return coverage in an effort to contain him. Lions went 9-3 to finish first in the NFL National Conference, tied with the Los Angeles Rams, while leading the league in fewest rushing yards allowed (1145) and fewest points allowed (192). Won National Conference playoff over Los Angeles Rams (31-21) & NFL Championship over Cleveland Browns (17-7). Christiansen was a consensus first-team All-NFL selection in each of the next five seasons, when he was also chosen to the Pro Bowl. Leader of the outstanding defensive backfield that became known as “Chris’ Crew”, he twice led the league in interceptions and ended up with 46 in all, three of which were returned for TDs. The Lions won four Western Conference titles and three NFL Championships during his tenure with the club, which ended in 1958. His first two years were his best for returning punts, and he ended up with a 12.8-yard average on 85 returns that included eight touchdowns. Christiansen later went into coaching and was head coach of the San Francisco 49ers from 1963 to ’67 and collegiately at Stanford from 1972 to ’76. He was inducted into the Pro Football Hall of Fame, Class of 1970.